Gallop. An experience Teddy hasn’t had in a while, and he took full advantage of the opportunity on the first morning turned out in his 2-acre field. At first, he stayed close to me as we walked around checking out the boundaries, but slowly he extended his circle, first at a trot and then the canter. After about 10 minutes, he bravely trotted down the hill toward the pond, then turned and galloped back up, bucking and kicking in a joyous celebration of exuberance. It was a great experience for us both and so fun to see him revel in simply being a horse. Such a beautiful horse! I love the personality you captured and the lovely composition. Thank you, Karen! I appreciate your comments! Great shot!! This is a beautiful animal! What a glorious shot! So free! Yes, he was so happy to be turned out. I’m glad the shot shows that feeling. Thank you! 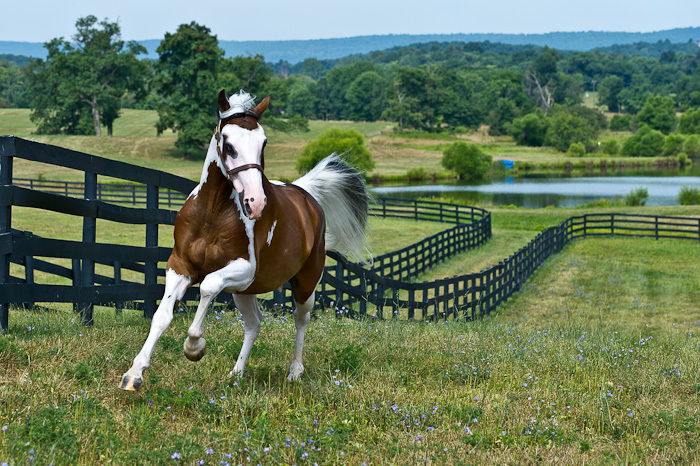 Gorgeous shot of the horse, fence and placement of all this beauty!